Home April Fools	I got my first tattoo!!! I got my first tattoo!!! I’ve been thinking for a long time about how I could express my gardening enthusiasm in a tattoo. I’ve never gotten a tattoo before since it always seemed a bit trashy; however, I figured something botanical would work. Heck, it could even be classy. Botanical prints are all the rage in interior design – why not in tattoos? The more I thought about getting a plant-related tattoo, the more I liked the idea. My big dilemma, of course, was – which plant should I feature? I toyed around with chaya, though that could be mistaken for a maple leaf and I didn’t want folks to think I was Canadian. I also thought about sweet potatoes, figs, mulberries or even a Chickasaw plum illustration with the Latin name beneath it. The Florida Food Forests loquat logo was also in the race but I decided against it. I’m always changing my business ideas and didn’t want to get trapped in what might later seem to be a bad decision. Fortunately, a great idea came to me at last… and it happened where many of my good ideas arrive: outdoors amongst my plants. As I was wandering through the food forest last week and checking out all the new growth, I almost tripped over the stump of one of my multi-year-old cassava plants and then noticed the lush new growth coming up from the ground. And then it hit me: cassava! It was the first perennial vegetable I ever grew seriously, plus it’s just a lot of fun to grow. I made my decision – and yesterday I pulled the trigger! Yeah, it hurt. Still totally worth it. Isn’t that great? 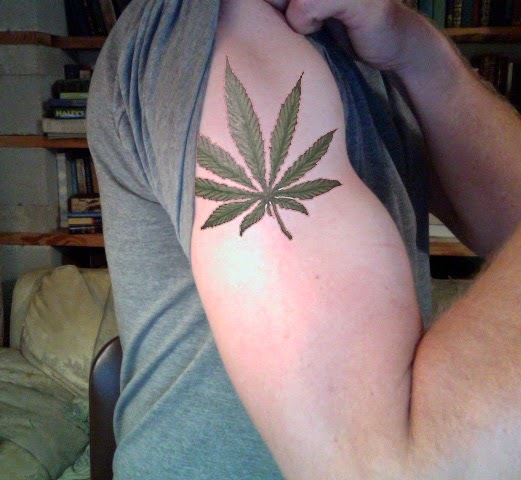 Rob (my tattoo artist) did a killer job on the details… it almost looks like you could pick the leaf right off my arm. When I went down to the tattoo place one of my friends recommended (thank you, Joel! ), I figured they’d have no idea what a cassava leaf looked like. Imagine my surprise when I saw it featured in many of their designs. It wasn’t like there was just a few tiny images in a book, either – cassava leaf designs were EVERYWHERE. There was a picture of one gal with cassava leaves all over her back, carried by flying cherubs… there was another one where a caterpillar was smoking a hookah while sitting on a huge cassava leaf (probably an after-dinner smoke… my favorite hookah tobacco tastes like apples, though who knows which flavor caterpillars prefer); there was even one guy who had a picture of a gigantic cassava leaf floating above a sunset. Seriously – there’s a LOT of cassava love going on. I honestly had no idea that the tattoo crowd was that into growing tropical staple root crops. It really gives me a lot of hope for the future of perennial vegetables in our nation – I’m going to have to get connected with the local tat conventions and see if I can score some cuttings of different varieties we can test on the homestead. I know – getting a tattoo is a big deal, and maybe I’m an idiot for doing it… but I don’t really think so. I’m proud of my cassava plants and am quite glad I found a botanical image I can live with for the rest of my life. I hope you dig it as much as I do. Manihot esculenta forever! I feel like I'm in some sort of Body Snatchers world, where everyone but me has succumbed to the aliens. That's one of my favorite films… definitely scary, though I couldn't figure out how the gal was transformed at the end after just falling asleep for a second. Made no sense since previously in the film there were pods in waiting. This is the best April Fools post today. You win! Cassava! Any self respecting food forest guy would understand that one, just like the Harley or Mother tattoo. You had me going until I saw the picture. Nicely done.